So when you see a person, that information is processed using at least the "Who is that person?" pathway, "Where is that person?" pathway, and "When am I seeing that person?" pathways to start. If you continue thinking about that person, other pathways like the "Why are you there?" pathway and the "How did you get there" may also be used, along with many other permutations. Problem solving can be improved by using these pathways. When trying to solve a problem, try slicing up the problem into parts that correspond to six pathways. Then draw a simple picture to illustrate the problem. Figuring out what kind picture to draw can be difficult, especially for the artistically challenged beyond age six. Each question or pathway can usually be express and answered using the following pathway-to-image formula, Roam's Six-by-Six Rule. To help translate problem into a useful image, use Roam's pathway-to-image translation formula he calls his Six by Six Rule. Problems can ALWAYS be solved using simple pictures. pictures that fit on the back of a napkin. Any problem can be clarified, if not outright solved, through pictures. We already know how to do this, so don't worry. You just need a little practice looking, seeing, imagining, and showing. 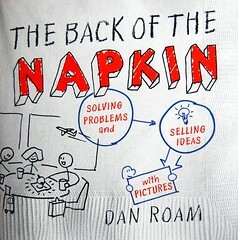 Dan Roam teaches us how to use a napkin. After age 6, we stop taking advantage of visual learning or improving it, shift focus to auditory. red pen people - sees problem as more complex than pic rep, so if you can get him pissed off enough, will go up, erase half the pic, and draw pic of real problem. "From elevator pitch or death by powerpoint," think in pictures. 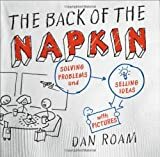 Drawing pictures in front of people engages everyone's mind, and talking and drawing is "manna for the brain." Visual thinking borrows from that natural process a bit more intentionally. It starts with looking (collecting & screening data), seeing (selecting & grouping), then imagining (reconfiguring, manipulating, analogizing), and finally showing (cleaning up, putting it all together).